The Purrfect Post is Designed for Cats to Love! Veterinarian Designed - Cat Approved. Tall - 31.5 inches tall, so your cat can stretch and achieve a satisfying scratch. Sturdy - Double-thick, heavy base ensures that this post won't topple over. 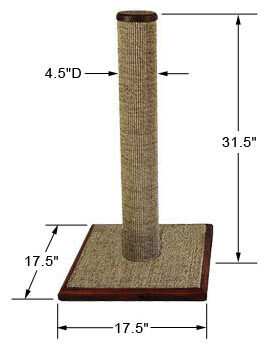 Sisal Fabric - Premium sisal fabric covers post and base, so cats can scratch vertically or horizontally. Cats prefer scratching sisal fabric over carpet or sisal rope. Attractive - Craftsman-made posts that are appealing to both you and your cat. Beautiful wood trims and caps available in light or dark stain. Made in the USA - High-quality materials and expert construction. Money Back Guarantee - If your cat doesn't absolutely LOVE this post, you can return it for a refund. For more info on this great post, click here. We have more videos! Click the "Product Videos" tab below to see more videos featuring the Purrfect Post Deluxe! ...and what's mine is mine. Bass and Treble, my two tabby cats, like their scratching post better than they like my furniture. Functional and fashionable! Got this for my sisters cat. Started using it right away! I have a larger one for my 2 cats. Both have been cat approved. Worth the investment no matter what style! I've just ordered a Purrfect Post Deluxe for a Christmas gift for my daughter's 2 black cats. The Purrfect Post is over and beyond anything you would buy in your local stores. It's stable, doesn't tip; stylish with quality materials; lasts (our cat's post has been in use 12 years! ); it's worth every cent. Oh, and YES! the cats love it. We absolutley LOVE this scratching post! We had one for years and the sistal was almost bare. We lost in in Hurricane Harvey. The new one is even better with a wider base. My cats were scratching and rolling on it before it was even put together. I have big cats and they can completely stretched and scratch. They LOVE it!! You will NOT be sorry!